Considering the goals I set to paint this army fast, you really would have expected faster progress than this... I thought Death Guard would make a good quick army as I would have less conversions to do. I guess I've gotten a bit carried away with adding detail and so assembly is taking me a long time. Here is an update of the progress I am slowly making. Here is a champion with power fist. 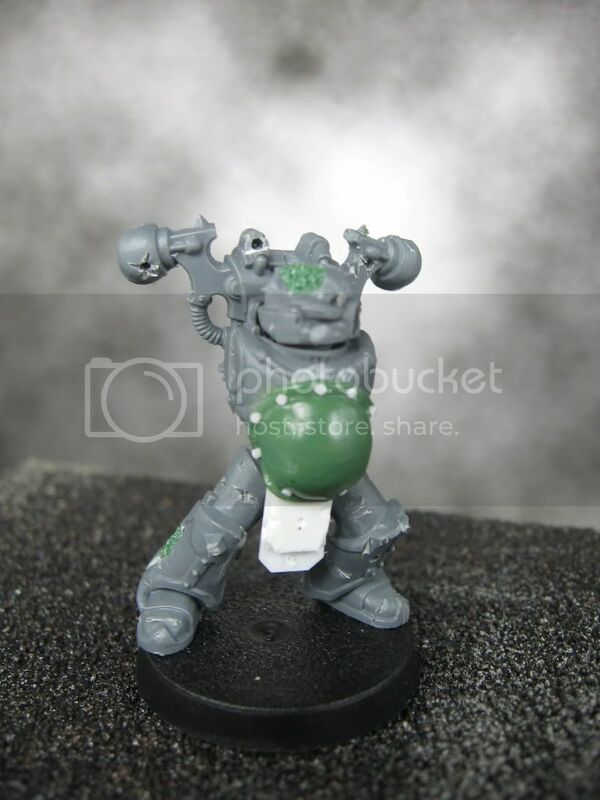 Torso is from the Forge World Death Guard kit. I added some tentacles, cables, and a metal tabard and extra armour on the legs from plasticard. It is hard to see in the picture, but I also added some fungus vents at the top of the backpack (the white really washes out in photos). The tentacles will be a bit of a theme with the force. I am hoping to make them not too over the top though. The cable is from Dragon Forge. I am quite fond of this one. I recently started using Gale Force 9 green stuff as it is way cheaper. It seems a little easier to smooth. I like it. Here is a picture of the colour scheme I am planning to use. Specifically, the rust and eyes. I am still undecided on how to paint the green. This model is still not finished. Mostly because I don't want to paint the wood. Thanks for visiting. Check back soon as I hope to have this squad assembled and painted soon(ish). I am still waiting for some more pewter cables to arrive. Once they do I will be able to finish the plague marine squad. Welcome to colonel schofer, our newest member! Hasta proxima! Today is day two of my goal to finish 1,500 points of death guard in about 40 days. 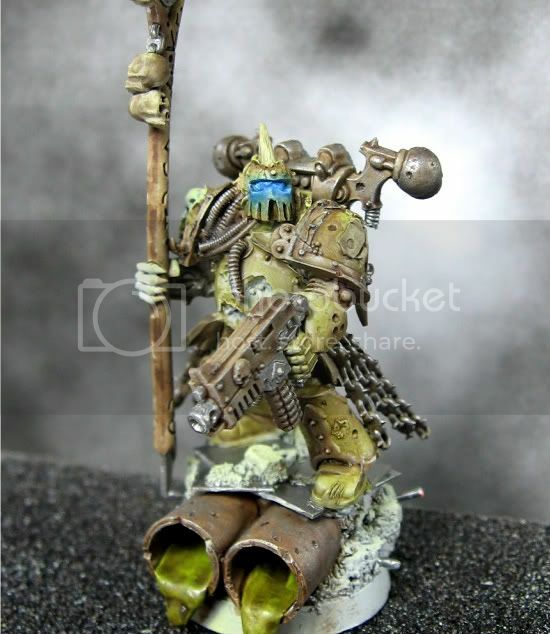 I have finished converting I have decided that my force will be themed after the Apostles of Contagion, a death guard splinter war band, during the Siege of Vraks. 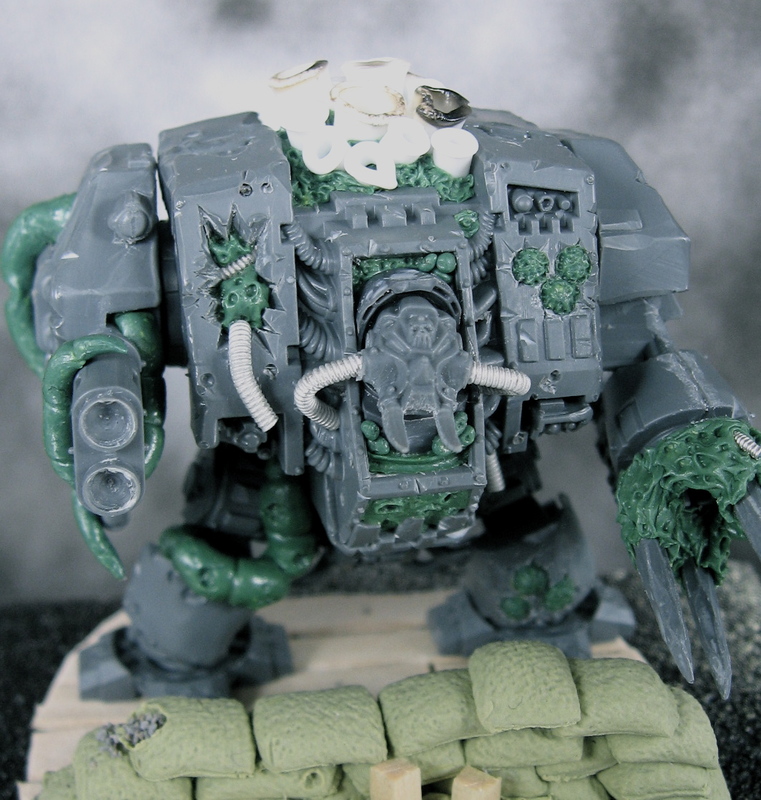 The first model I have finished converting is a dreadnought with close combat weapon and multi-melta. The model is based on the AoBR dreadnought. I did a lot of sculpting and tried some new techniques to bring this model closer to my vision. I decided to convert this model so that it looked like the dreadnought was possessed by disease and fungus and other organic matter and that it was exploding through the shell of the dreadnought in places. 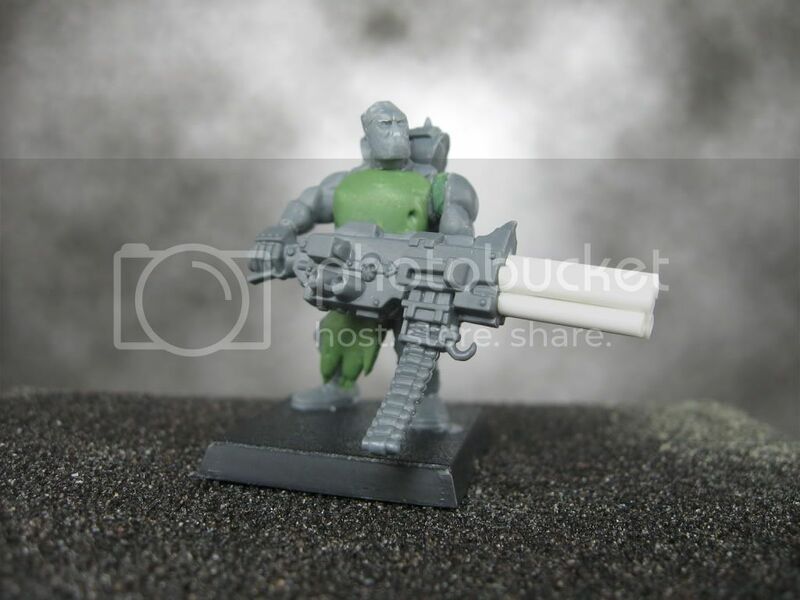 The close combat weapon was made with crudely carved sprue and greenstuff. The tentacles around the multimelta are my favourite bits just now. 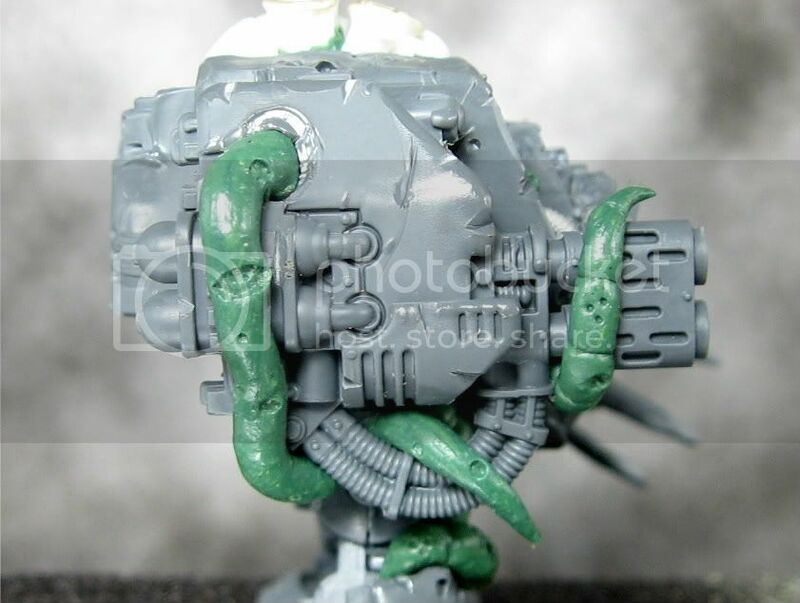 I know it is over the top, but I really wanted to try sculpting some crazier things for this army. I melted the leg guard a little and added some details to the lower part of the chasis. 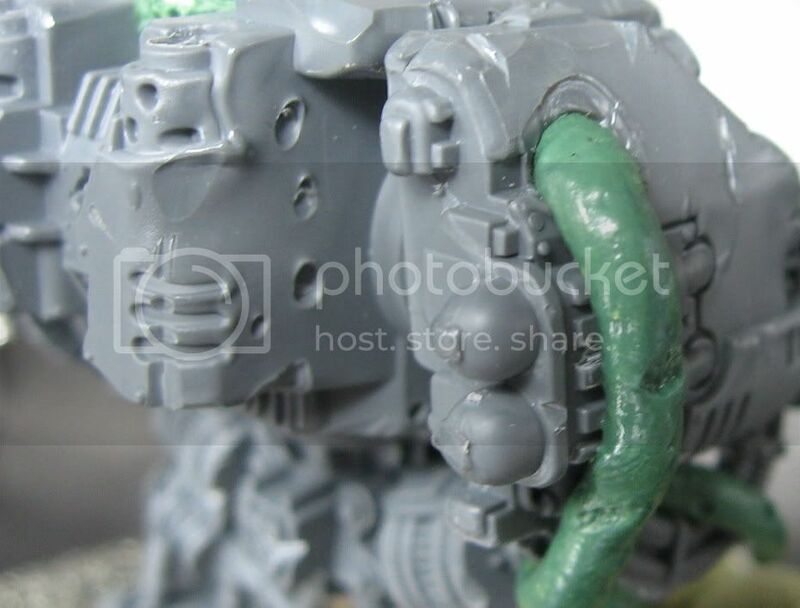 You can see the nurgle icons on the left leg here. Unfortunately they are obscured by the base. My other favourite bit. 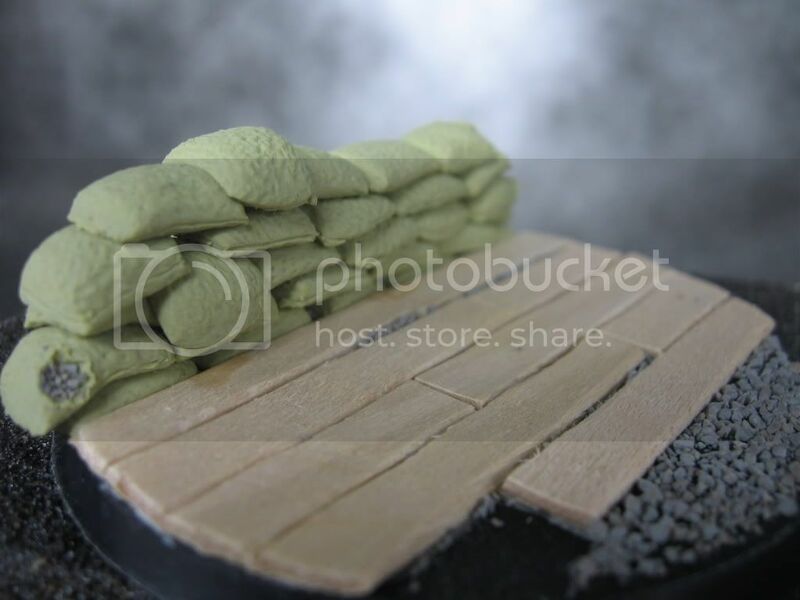 I made fungus bits on top using plasticard rods, greenstuff, and a candle. Here you can see where I melted the back panel. 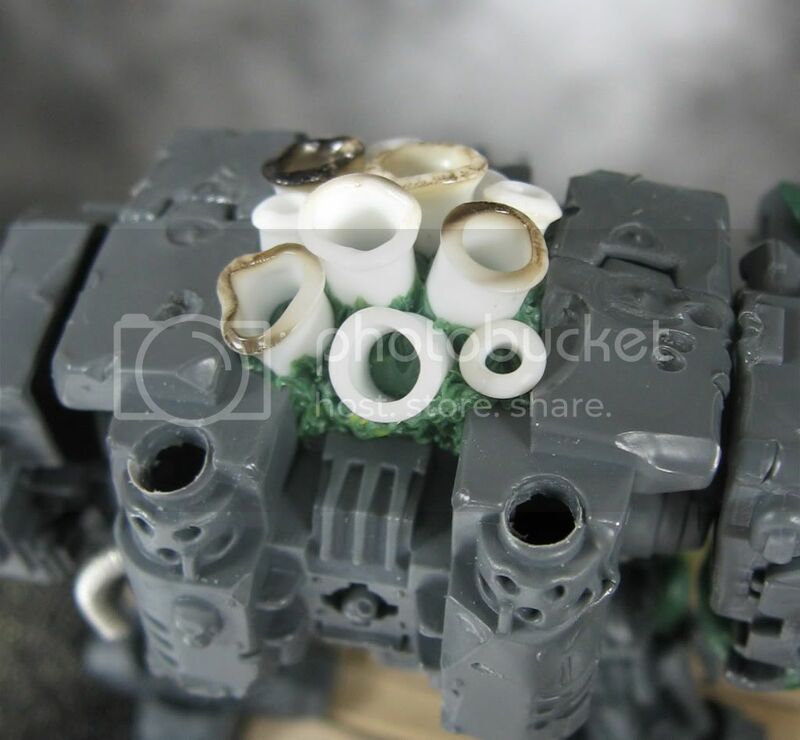 Kind of matches the armour on the forgeworld nugle dreadnoughts. The bases for this army will all be trench themed. I made each sandbag out of milliput. I originally planned to resin cast this base (hence the amount of work put into it) but I couldn't find a casting kit at Michael's and I don't really want to order one. I can easily recreate it another time though. Come back soon for more updates. 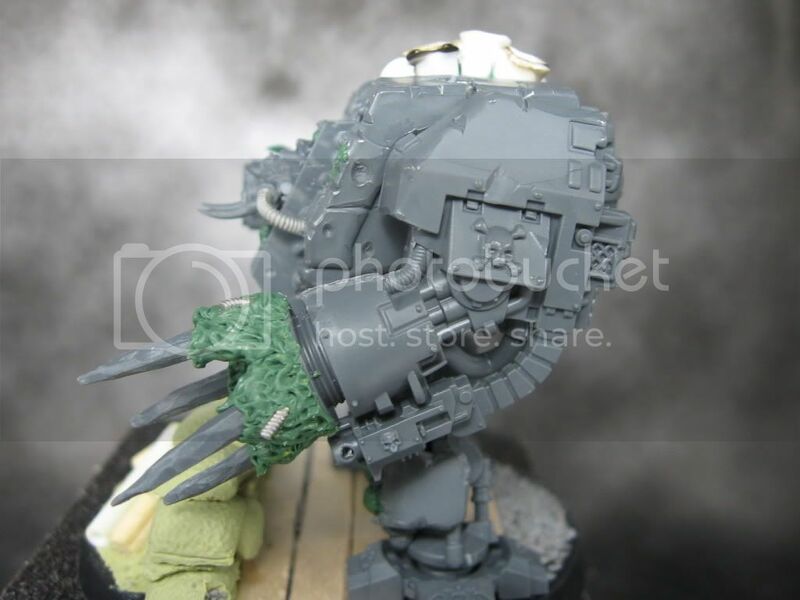 I will assemble 7 death guard plague marines and then I will spray and paint the plague marines and dreadnought in one go. 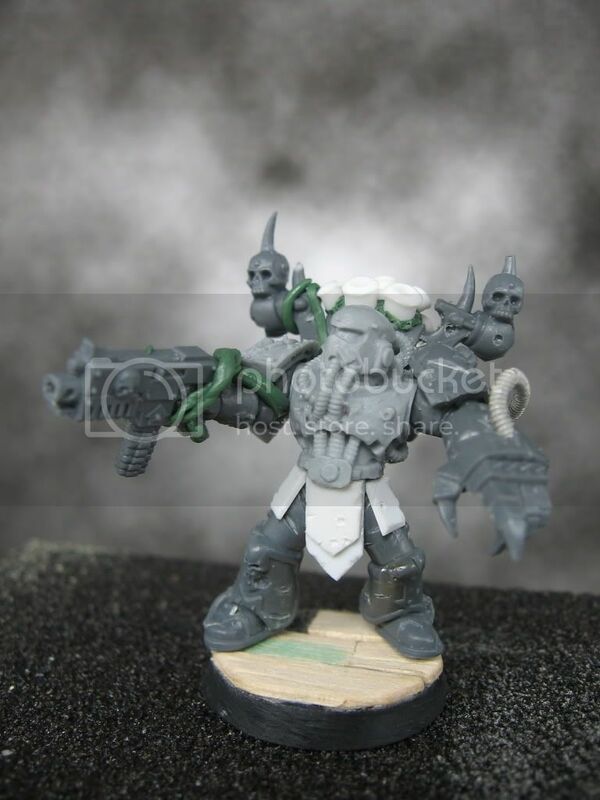 Then I will do the same with 7 more marines and a demon prince I am excited about converting. Welcome to RatC's newest members unrealistic artist, musings of a smurf, and uniteallaction. Thanks for visiting! In the summer I decided I would finally get "into" 40k. I got a starter box with space marines and orks in it for my birthday when I was thirteen or so. All of my friends played fantasy though and none were interested in 40k. I painted a selection of different models and forgot about it for a while. My current interest in 40k really grew from terrain and skirmish games. A friend I played Mordheim with convinced me to try Death Squads (a 40k skirmish game, made by fans). I really enjoyed building the futuristic terrain. Over time I got more interested in the 40k story and fluff. I know that in many ways it parallels human history and civilizations (and many of the not so nice parts...) but I really love the grim dark setting. I like the corruption from within and assault from the outside. I like the futility. That sounds pretty dark. I don't support these things. That's why I have finally decided to breaking it all apart with a plague straight from the eye of terror. 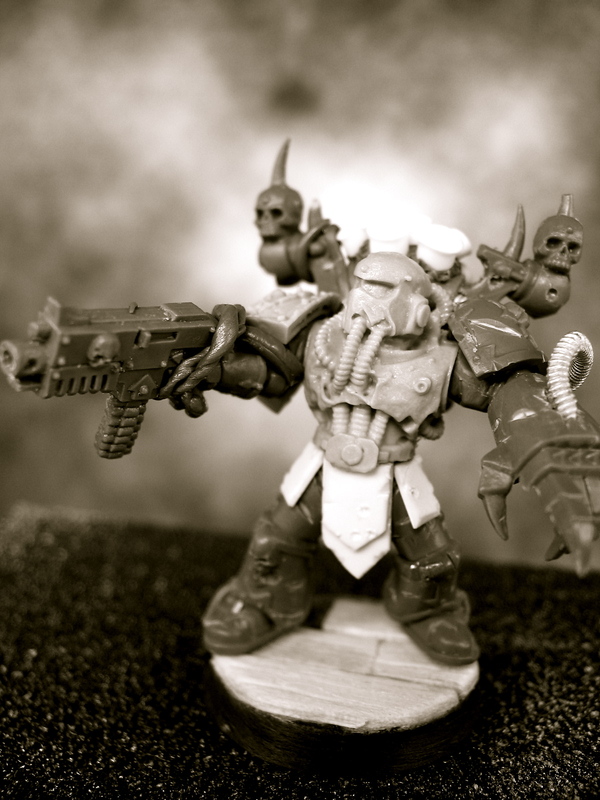 Visitors to this blog have probably noticed some waffling on what 40k army to start lately. I've come up with some ideas for using a grey knights list with marines and with my imperial renegades. I have a selection of Death Guard models all ready to paint though. I have finally settled on a paint scheme that I like and so I think I am finally ready to really get started with this force. 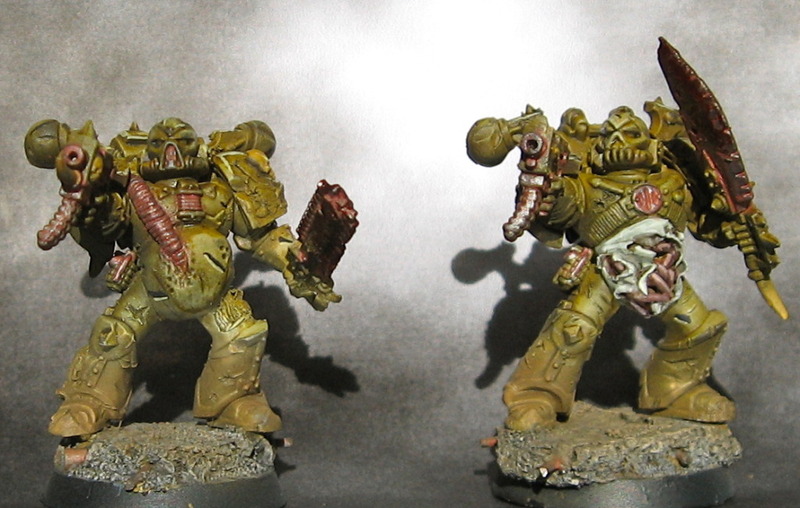 Some Death Guard test models. Not really happy with them. Too much yellow. I have remedied that now. Less yellow! On March 31st there is a local tournament. 1,500 points. As someone who may have never fielded a fully painted and based force this is a pretty ambitious objective. I have more free time coming up in the next few weeks though and will endeavour to complete an army in this time frame. The basic army will look like this. I know it is not an optimized force but I really don't want to buy and build vehicles until the new CSM codex comes out. I am going to build these first and add plague marines/havocs/chosen/more HQs as needed to reach 1500 points. This is definitely not a really strong force. Footslogging is not very popular at the moment. That's okay. I am not looking to win very much. 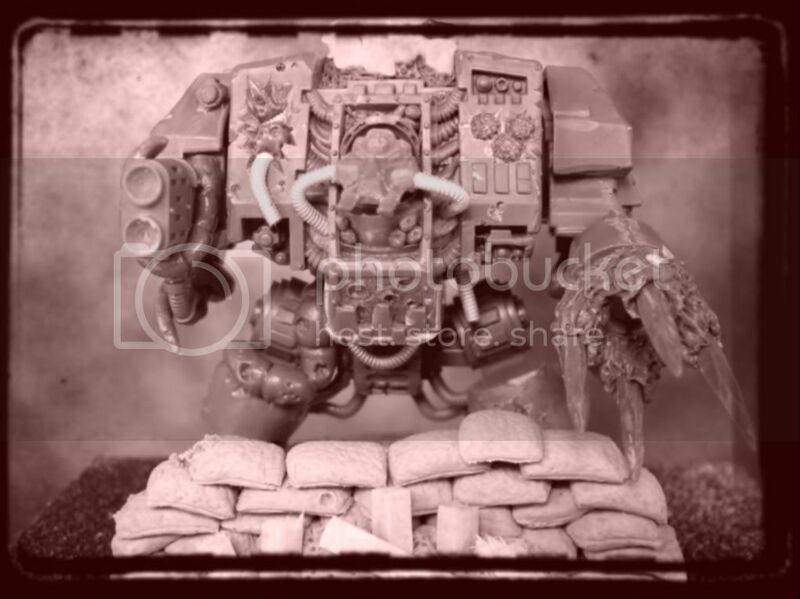 I would like to make the list as strong as possible within the confines of Death Guard fluff and my own aesthetic choices. I don't want many vehicles (walkers are ok, I like converting dreads!). I want lots of ground pounders. I want models that I am sure will be included in future Death Guard lists. Any tips or ideas for bulking out the force and making it a bit tougher within these guidelines would be greatly appreciated. 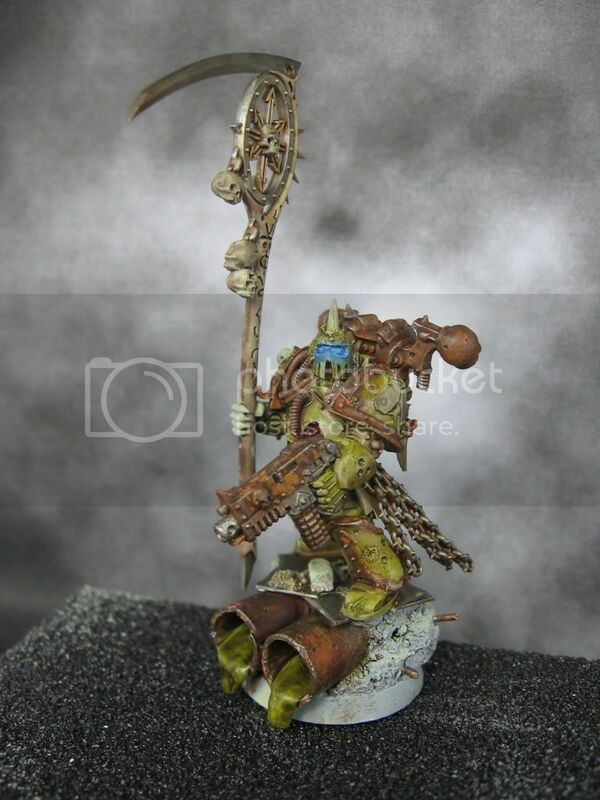 Death Guard character I have been working on. He looks much better now. Totally changed the armour hue and the rusted metal. Visit back in the next few weeks to see my progress. I've added a progress tracker on the right and a poll to help me improve my army. Can I complete this small force in that amount of time? Who knows! Thanks for visiting and thanks in advance for tips and ideas! I started converting a renegade psyker to add to my imperial renegades squad. The model is based off of the High Elf Island of Blood sorcerer and the Warriors of Chaos Sorcerer on the manticore. I'm not really sold on the chains. I think I will take them off and sculpt a tabard from greenstuff. I used a paper clip to mount him over the base to look like he is floating a little bit. I don't think he will be used that often in my renegades squad in games, but I am not playing many games lately. I may as well build interesting models! 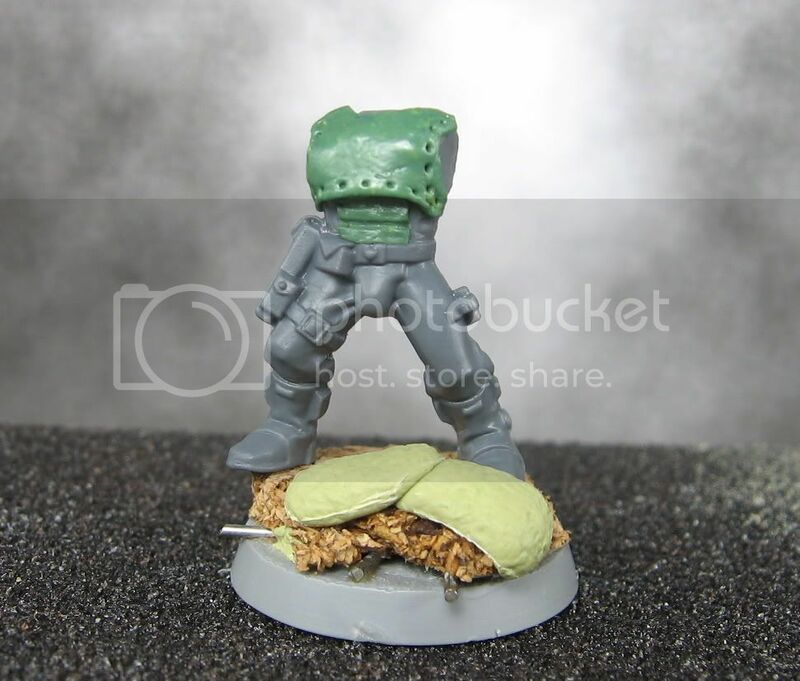 I started building another renegade sergeant as well. I'm thinking that I will take pictures of each step with this model to show how I do each step of my renegades. 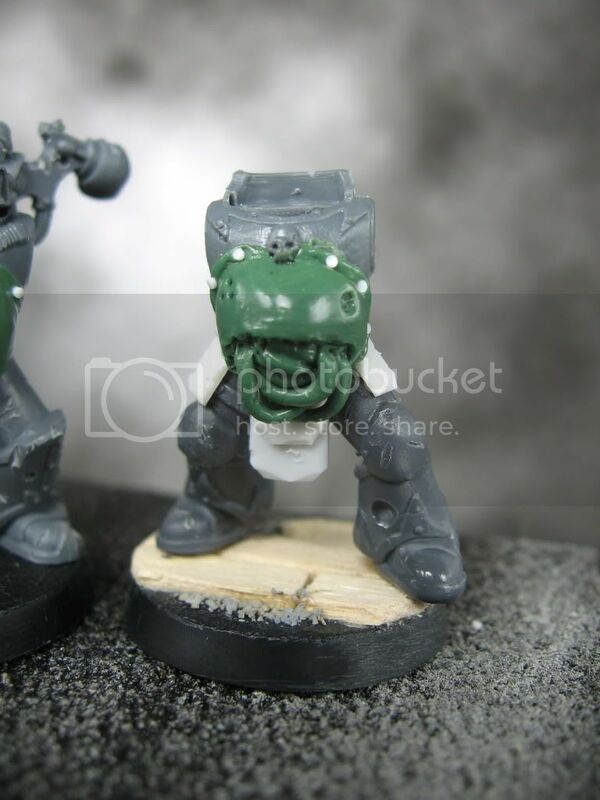 This model will have a bit of carapace armour and a hell gun. I've also got another heavy stubber conversion I am planning to finish soon. I know the gun is ridiculously huge and would probably crush him. Maybe it is nice plasteel? 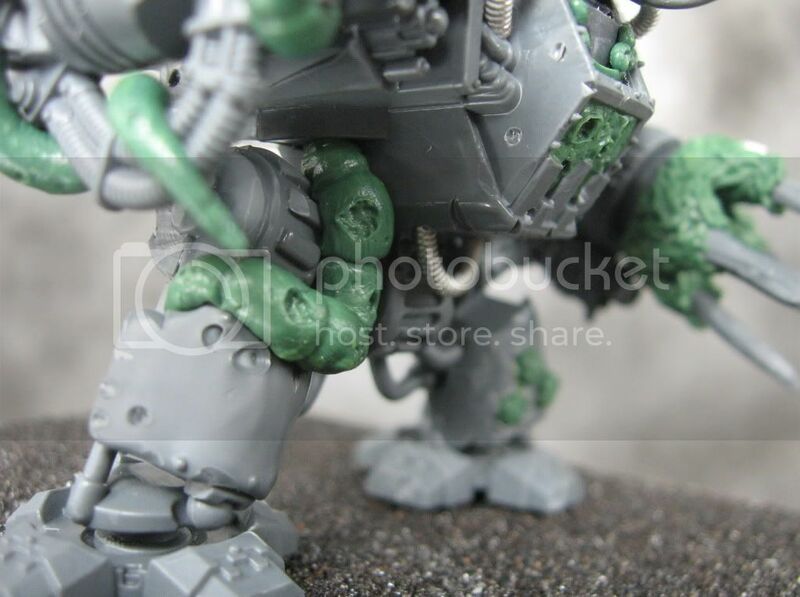 The body and legs of this model are based off of a chaos marauder. Continuing my quest to use every plastic human in this squad (I kid, but I have been building them from many different kits). More to come soon. My current busy work contract ends in a week and my productivity should drastically increase after that (even if my overall life productivity decreases). I have some big ideas for some projects I am planning to work on in the next little while. I'm still trying to figure out how to make a 40k army work with the models I want to use. As I wrote last week, I was considering using my renegades as Grey Knights henchmen. The only issue with that idea was that they really were lacking a strong theme (other than corrupted and gross). It felt a bit too much like trying to fit a round peg in a square hole. 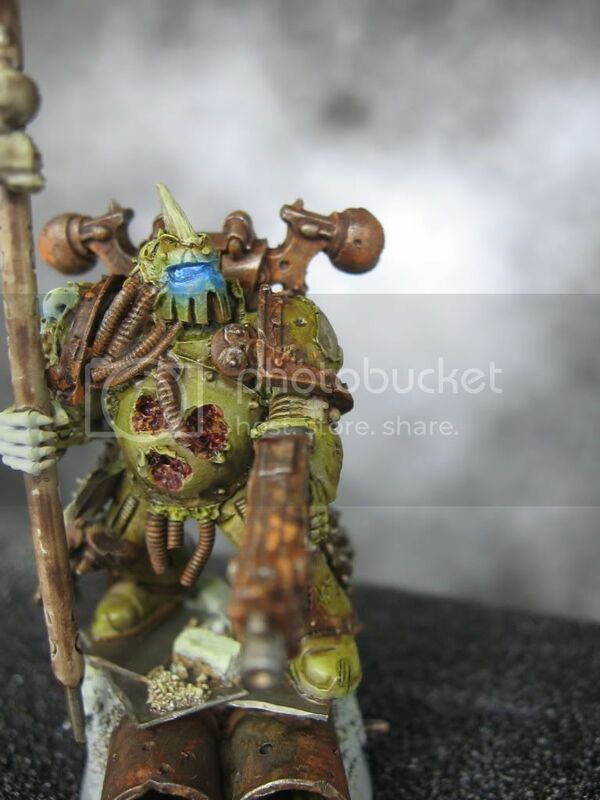 Now, I am considering making an army based around a Nurgle infested Dark Mechanicus force called Plagus Mechanicus. This force will allow me to use a list I like, build a quality army that can potentially be used with a new chaos book, and has huge conversion and modelling potential. As I wrote in my last counts as post, I really like the potential offered by the Grey Knights codex. I like that I can have an elite force, less vehicles, and a mix of marines and guard equivalents. I enjoy playing with elite armies that individually are much better than the opposition. I'm not sure why. Maybe I just can't deal with many things at once. When my unit gets where I want it, I want it to crush the opposition. My fantasy armies (5th edition Bretonians (the hardest word to spell! ), 7th/8th edition Warriors of Chaos) were the same way. I would like to include a few vehicles but I really don't want to be reliant on having a fully mechanized force as it is hard to transport and expensive to buy. Finally, I want to have both marines and some piddly humans too. There is a lot of uncertainty with the future of 40k just now with rumours of a new rule set and a new chaos codex on the horizon. A Plagus Mechanicus force gives me some flexibility in this regard. If a new chaos codex allows hecnhmen/renegades mixed with marines then I could potentially adapt the army to use this new codex. The Grey Knight codex is also new and should stay competitive for a long time. I don't plan to abuse counts as but I like to have different options. 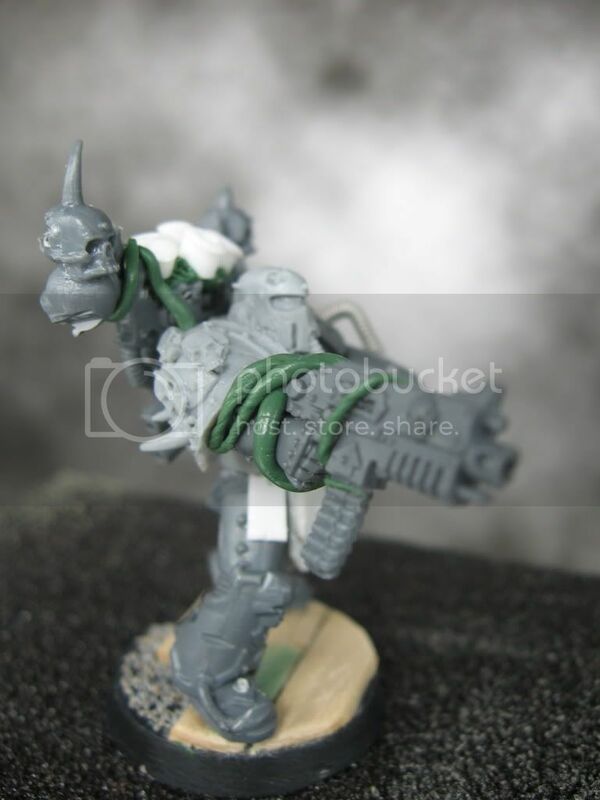 The number one reason I want to build this army is for the potential for conversions and modelling. I really like sculpting and modelling and this force would offer that opportunity in spades. I like sculpting robes and nurgly bits. I also like adding cables for a rotten tech look. This would be a melding of two different ideas and offers the potential to be creative and build things in my own way. I like death guard but I have been a bit uninterested in their paint scheme and the fact that so much of the look is a bit predetermined. Coteaz-Allows henchmen to be troops. 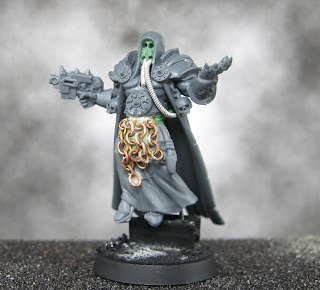 Model his as some sort of techpriest. 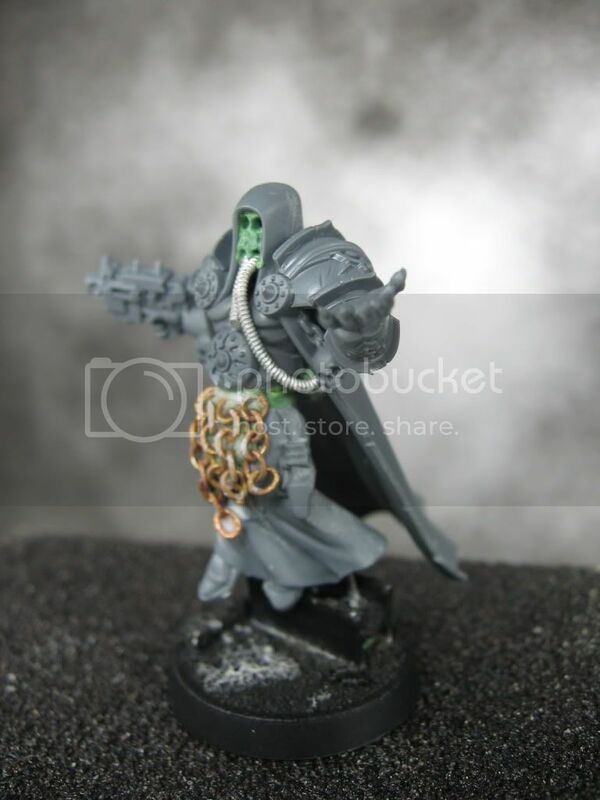 Psykers-modelled from flagellants to be floating, hooded with robes and gas masks. 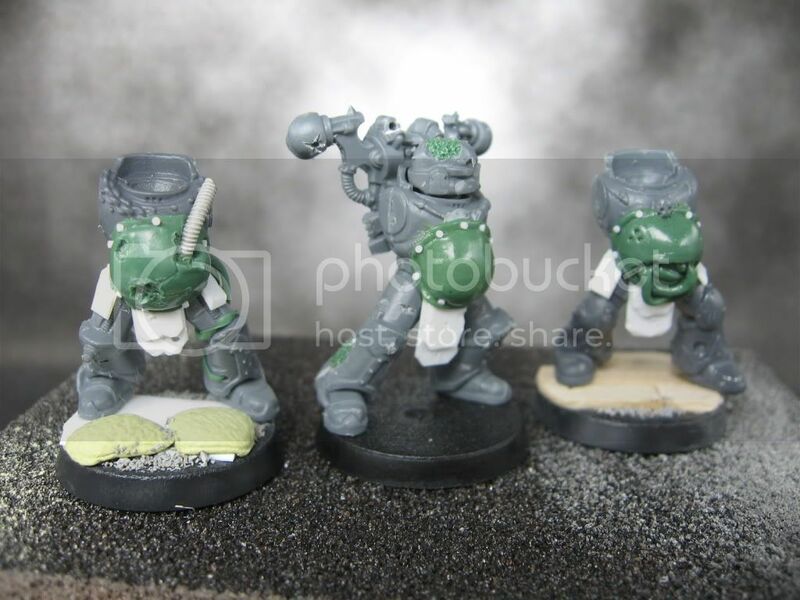 Marines-Modelled with chaos marine torsos, and a mix of different arms. Legs will be elongated with robes and cables. Make them look half machine and half human. Mount some of the weapons on backpacks. Henchmen-different henchmen made from skaven stormvermin, cadians, flagellants, etc. Servitors-as I made them before. 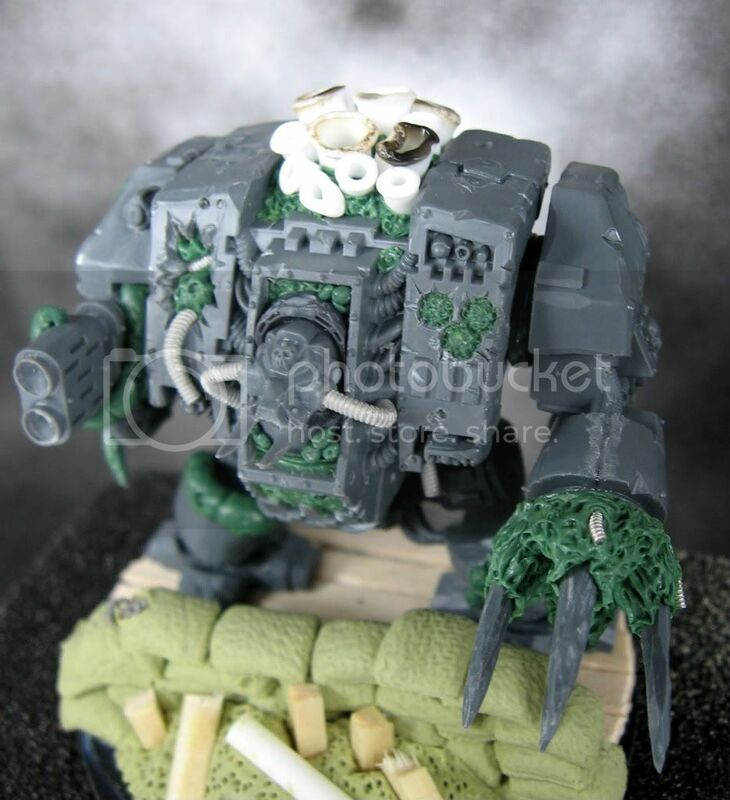 Dreadnoughts-As usual but modelled to fit the theme. Terminators-I want to include them but have no ideas on how to make them fit the theme. Maybe give them four spider like walking legs? Any ideas? Feedback and thoughts on a build like this are appreciated. Thanks!